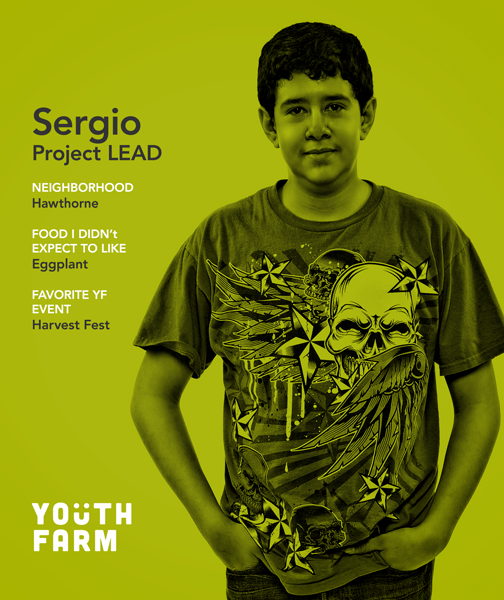 The first time Sergio came to Youth Farm he just remembers a lot of people. An introvert at first, Sergio has come a long way these last two years. Today he is a Project LEAD, and oversees young Youth Farmers while developing mentorship, conflict resolution and leadership skills. “I understand them and help them do the right thing,” Sergio says, “I show them responsibility and that they have to take their own actions to get things done.” During cooking classes Sergio oversees four kids in making stations for salads, desserts and main dishes. Youth Farm. Growing confidence. Growing Leadership.